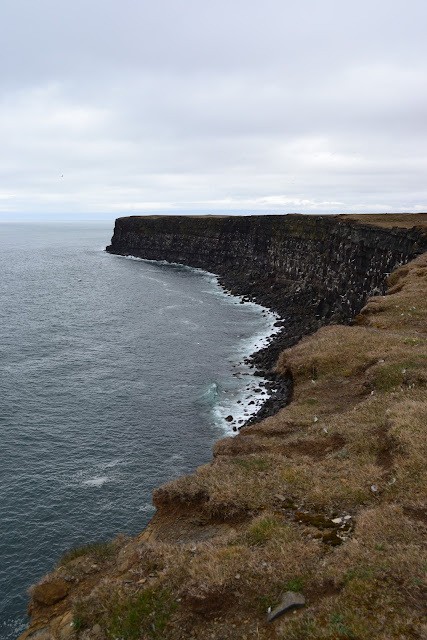 The Krysuvikurberg area is accessible by car, preferably a four wheel drive vehicle, but if you're a hiker, you can also walk from the main road to the cliffs, which is a good 20 to 30 minute hike through rough terrain. Even the road is rough and bumpy, but our little rental made it through. It even drove through a creek. Apart from the breathtaking view, the Cliffs of Krysuvikurberg is home to some of the largest colonies of seabirds found in Iceland. According to the brochure I got from the inn, it is about 15 km wide and a great place for hiking. The crescent shaped cliffs battered by wind, snow and rain. The vastness of the cold sea, the crescent cliffs, the chilly temperature that made me shiver, the wind pushing and pulling yet the birds seemed to be at home. I wasn't. 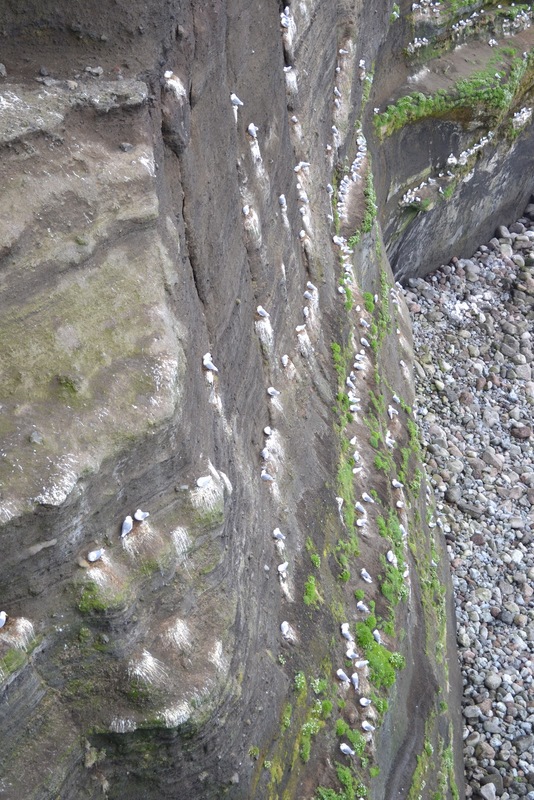 A colony of birds live on the side of the cliffs. To them, this is home. No wonder the birds love it here, they have the best view in the world - the horizon and the sea. This is no place for bikinis or shorts or spaghetti straps. The wind is fierce and the chilly temperature crept through every bone in my body. Still, I managed to smile. I do love Iceland. At that time, we were the only ones visiting the cliffs. Perhaps everyone went to bed as when these photos were taken, it was close to 9 PM. What gorgeous scenery. Those birds sure live in a beautiful place. what a tough name to pronounce. the cliff is just magnificent then add the bird colony, wow that's a must see indeed. glad to finally see you in your blog. and kepi too. When I was still very active with postcard exchange, there was a very kind woman who kept sending me postcards from Iceland. She lives in Reykjavic. And her stories written on the back of the each postcard often amazes me. Bigla ko siyang naalala because of this post. Salamat. Unfortunately, the records I have of the addresses of people with whom I was exchanging postcards got lost due to computer trouble. Is that really you in the picture? Kung ikaw yan ay masaya ako to have finally seen you here. When I was still active with postcard exchange, there was this woman from Iceland who was really very nice to have kept me sending sending postcards. She lives in Reykjavic. Thanks to your post, I am reminded of her and her kindness. I love each and each postcard she sent me. And the stories she kindly wrote on her postcard really amazed me. Err, 9 pm and there's still light? Wow! I couldn't imagine myself in a place where there is still sun at 9pm. It looks like late afternoon..and very cold.